This fas­ci­nat­ing pro­duc­tion is per­formed in vignettes. The sto­ries are all dif­fer­ent but are mag­i­cally con­nected as these seven women move the minds, hearts, bod­ies, and souls of their char­ac­ters quickly and pow­er­fully as one at a time they bring them to life. These sto­ries have no bound­aries, their faces tell no lies. They are black, they are white , they are young, they are old. Their skin col­ors may vary but they all share an unde­ni­able thread — they are all WOMEN shar­ing the same plight — and they all EMERGE! Per­for­mances are on Thurs­day, April 7 at 7:30 p.m., Sat­ur­day, April 9 at 2:30 p.m. and 7:30 p.m., and Sun­day, April 10 at 3:00 p.m. This entry was posted in General Information on February 24, 2011 by stocktoncivictheatre. For the lead­ing female role in Stop the World — I Want to Get Off, run­ning March 9 through April 3, direc­tor Judy Caruso Williamson has cho­sen Sonja Phipps, an actress new to the SCT com­pany, but well suited to the mul­ti­ple roles of Evie and the three other major love inter­ests in the main char­ac­ter Littlechap’s life. Sonja Phipps is a grad­u­ate of Lodi’s Tokay High School and an expe­ri­enced actress and singer, hav­ing played lead­ing lady roles in numer­ous pro­duc­tions at Kiley’s Din­ner The­atre, includ­ing A…My Name is Alice, Star Span­gled Girl, Out of Order, and It Must be Love. 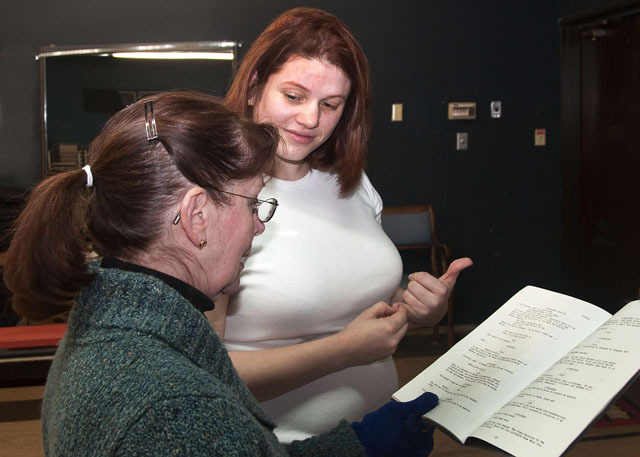 She has also sang with choral groups at Delta Col­lege and other local venues. Sonja has two chil­dren, and works in her family’s Lodi and Stock­ton busi­nesses, The Music Box stores. Her cur­rent life phi­los­o­phy? “I may not be get­ting any sleep, but I’m hav­ing a won­der­ful time!” Sonja also says that one of the main things that drew her to this pro­duc­tion was the oppor­tu­nity to work with Direc­tor Judy Williamson. Judy Caruso Williamson has been active at Stock­ton Civic The­atre since she was 16 years old. Whether act­ing, direct­ing, chore­o­graph­ing, or work­ing with the Foot­lighters vol­un­teer group, Judy enjoys every­thing she does at SCT, and expresses great appre­ci­a­tion for the under­stand­ing and sup­port of her hus­band Mar­vin and their entire family. The Odd Cou­ple, by Neil Simon, is a com­edy clas­sic that has stood the test of time. Most peo­ple know it from the very pop­u­lar TV series, which starred Tony Ran­dall and Jack Klug­man, and the hit film that starred Wal­ter Matthau and Jack Lemmon. It actu­ally began its life as a Broad­way smash in 1965, star­ring Wal­ter Matthau and Art Car­ney. It has been trans­lated into 15 lan­guages and has had pro­duc­tions in at least that many countries. The Odd Cou­ple is the story of two friends, Oscar and Felix, one sloppy and the other fas­tid­i­ous. Oscar Madi­son and his friends get together at his upper West Side apart­ment once a week for poker. Dur­ing one of the games, Felix Ungar lets the guys know that he and his wife are sep­a­rated, and being a lit­tle over­wrought and neu­rotic, he does not know what he is going to do. Oscar, being a good friend, asks Felix to move in with him and share his apart­ment. That was his first mistake. How­ever, if Oscar hadn’t made that mis­take, we would not have had the oppor­tu­nity to spend time with these guys in this very funny play. They are polar oppo­sites, and that is what pro­vides the fun. The play is really about friend­ships, and the lim­its to which we can push those friend­ships. In 1985, Neil Simon wrote a female ver­sion, and it was mod­er­ately suc­cess­ful, but there seems to be some­thing fun­nier about two men in the same sit­u­a­tion. There are two won­der­ful parts for women in this show — the Pid­geon Sisters. Audi­tions for SCT’s pro­duc­tion of The Odd Cou­ple are being held on March 13–14, 6:30 p.m. at SCT. Jaye Vocque is mak­ing his SCT direc­to­r­ial debut with this play. A three minute comic mono­logue is required for audi­tions. You can find details on the web­site. See you there! This entry was posted in General Information on February 21, 2011 by stocktoncivictheatre. This entry was posted in General Information on February 20, 2011 by stocktoncivictheatre. SCT Artis­tic Direc­tor Jim Cole­man is a pro­fes­sional musi­cian who worked on Broad­way and around the coun­try as a Musi­cal Direc­tor for over 30 years. He will next direct 42ND Street, which will be on stage at SCT dur­ing June-July 2011. To track or not to track? That is the question! As we all know, the orches­tra is a huge part of any musi­cal — in fact, you can’t do a musi­cal with­out one! At SCT, we are very for­tu­nate to be blessed with many fine musi­cians in the Stock­ton area who are will­ing to work for what we can pay them. In the past cou­ple of Sea­sons, we have pro­duced three musi­cals that have been “tracked”. Those were The Pro­duc­ers, Joseph and the Amaz­ing Tech­ni­color Dream­coat, and Okla­homa! A tracked musi­cal is one in which the full orig­i­nal Broad­way orches­tra­tion has been recorded in a the­atre or record­ing stu­dio, and is made avail­able for local pro­duc­tions across the coun­try. In our area, Sierra Reper­tory The­atre and Fal­lon House have used the track­ing sys­tem for years. You may ask, why has SCT started doing this? The expla­na­tion is grounded purely in eco­nomic con­sid­er­a­tions. I am a musi­cian myself, and I love live music, but today we face a harsh eco­nomic cli­mate, where we must watch what we spend with­out dimin­ish­ing the qual­ity of the pro­duc­tions we bring to our loyal patrons. 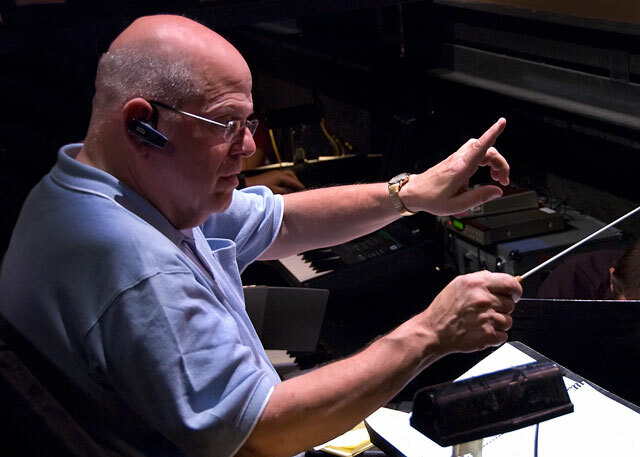 The music for a show is a major bud­getary item. The cost of pro­vid­ing a live orches­tra for a sin­gle pro­duc­tion comes to around $8,000.00, while the cost of pro­vid­ing a tracked orches­tra­tion is about $2,500.00. That is a huge sav­ings for us, and thank­fully our musi­cians have been very under­stand­ing about the sit­u­a­tion. Not all shows are avail­able in a tracked form, how­ever, and for those, we still use a live orchestra. Live music is not dead at SCT, and it will never be, but for some shows tracked music is an excel­lent choice. In our effort to pro­duce great shows, while uphold­ing qual­ity and con­trol­ling costs, we are pay­ing close atten­tion to every­thing we spend.